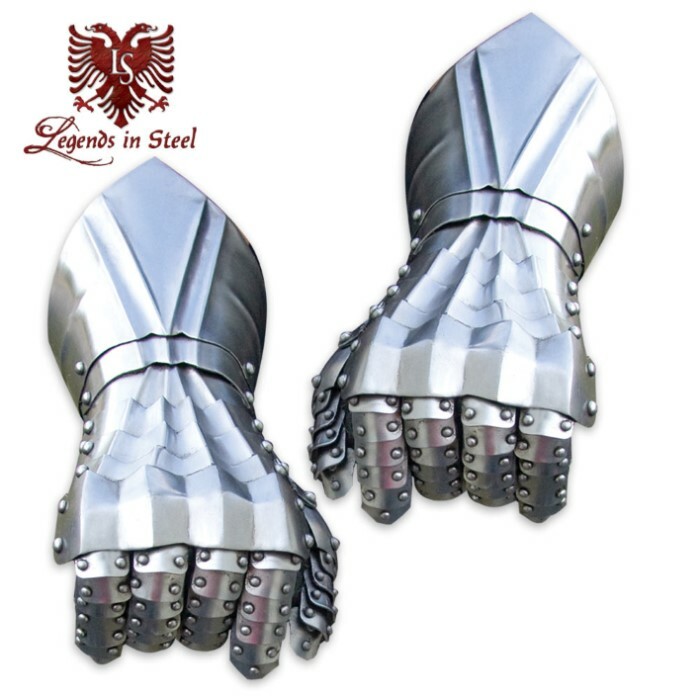 These completely jointed, wearable Knight"s gauntlets are constructed from durable 18 gauge steel. They offer leather straps and 18 gauge steel buckles for a tight and secure fit. These gauntlets feature steel bolts on the sides and on the fingers to give them a distinguished look. They are perfect for reenactors and collectors alike. I love these. I tested them with a blade and they only got a light scratch. I do wish however that they came with gloves so the fingers could follow along with but I'm sure a leather shop can affix a good pair to make them combat worthy. Thanks True Swords! The craftsmanship is, without a doubt, very well done. However, as stated by jstch00tme, there is no glove, no finger loop, nothing. You can't wear it like it says in the description. There is a leather lining where the fingers would go, but no way to secure it in place. When I purchased it, my family and myself were under the impression that there would be a glove inside the gauntlets, but we were wrong. It's still a good purchase, it just takes tinkering to actually make it work. Also, not intended for use by people with small hands. Ignore the image of the guy's hand, these gauntlets have no glove, leather lining or even finger loops for that matter. If you intend on wearing them you will have to alter them to do so. If you simply intend on displaying them, they are stunning to look at, very well made, heavy gauge steel. Great craftsmanship overall, however a bit pricey for a show piece. more like jousting guards tho and da straps are kinda loose for just bare hands (duh) (you may need to get the chain-mail gloves too). ill tell u this now these aren't the fancy gauntlets u c in da movies. but lucky im quite savvy with these kinda things and i plan on making em da fancy gauntlets. no im not telling u not to buy them, just to know what ur buying. NOTE: they will help ur hands when sparring, i beat da crap outa my hands yesterday and getting these made my hands alot happer lol. 1 reasion im not sad about buying em.